The Kingdom of Belgium is a country in Western Europe, bordered by the Netherlands, Germany, Luxembourg, France, and the North Sea. Belgium sits at a cultural crossroads between Germanic Europe and Romance Europe. It has two main population groups: the Flemings, Dutch speakers living in the northern part and in Brussels; and the Walloons, French speakers, mainly in the south and in Brussels; plus a small number of German speakers in the east. This cultural and linguistic diversity is reflected in its complex institutions and political history. Independence: 1830 Currency: Euro (€)1, Prior to 1999: Belgian franc. Geographically and culturally, Belgium is at the crossroads of Europe, and during the past 2,000 years has witnessed a constant ebb and flow of different cultures. Consequently, Belgium is one of Europe's true melting pots. 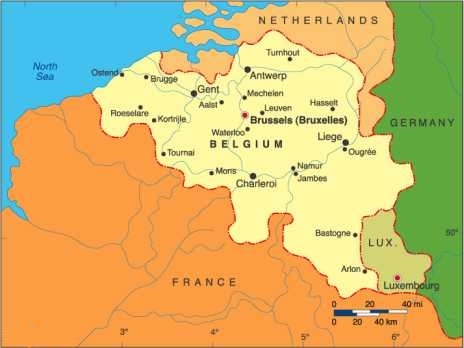 During most of its history, Belgium has been part of the Low Countries, which also comprises the Netherlands and Luxembourg. Other pages in my Belgium series.